The deep contour of the Wholebody Recovery category, the Dormeuse natural latex therapeutic mattress gently contours your body eliminating negative space and ensuring full posture support. Top performing choice among athletes and wellness experts for accelerated recovery from stress, training and injury. This is next level sleep. The Dormeuse has been unanimously recognized by several leading wellness institutions, wellness centers and pro-sports medical teams as the core for true recovery and total wellness. Featuring Essentia’s patented molded technology and natural memory foam for deeply contouring comfort and support. You’ll experience a soft yet very supportive, cradling sensation for your shoulder and lower back arch. 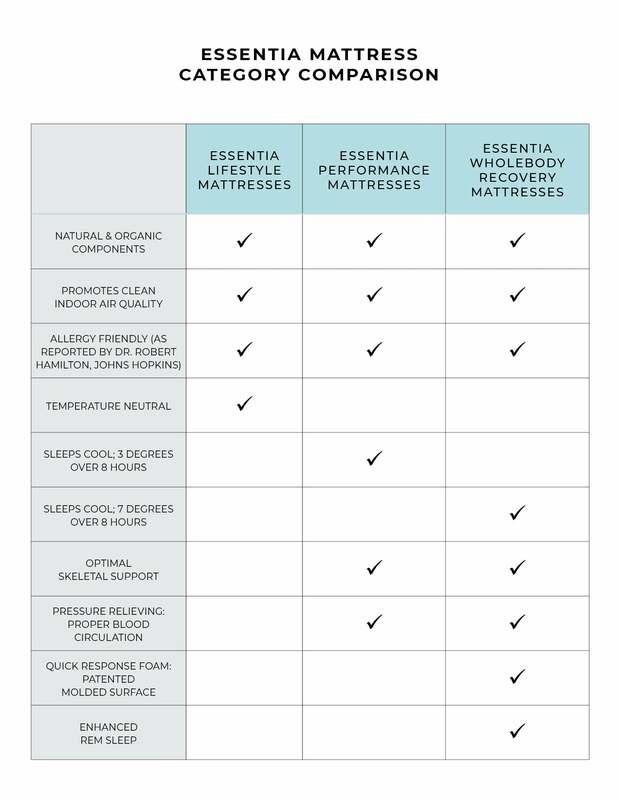 Made in Essentia’s GOLS and GOTS certified organic factory using only the highest quality natural and organic ingredients the Dormeuse reduces VOC exposure and promotes a clean air environment. Fast response foam allows you to experience ease of movement which reduces sleep interruptions while providing unmatched full body spinal support. The Dormeuse eliminates negative space, offering pressure relief that increases blood circulation thus eliminating numbness and soreness. The Dormeuse has been consistently recognized by several leading wellness institutions as the core for true recovery and total wellness.